Behind the wooden altar in the sanctuary at Mission San Francisco de Asís, is a wall painted in the late eighteenth century by Indian labor. Painted directly onto plaster, in ochre, white, red, yellow, black, and blue/grey, the mural, which is adorned with abstract patterns as well as Christian imagery, is still virtually unknown to the public, despite its rediscovery and subsequent publicity in early 2004. This mural covers the entirety of the rear wall of the church, behind the historic wooden altar. It measures 22 by 20 feet and includes two statuary niches. It was eclipsed in the year 1796 by an impressive baroque-style relief sculpture shipped from San Blas, Mexico called a reredos. This reredos continues to stand as the backdrop to the mission altar and has concealed the wall painting for over 200 years. The construction of adobe walls for the mission church began in 1788 with the manufacture of 36,000 bricks by native laborers. By 1790 the walls were completed, plastered, and whitewashed. It is most likely between this time and the dedication of the church on August 2, 1791 that the mural was painted. Thought to be the first wall painting of its kind in the San Francisco Bay Area and one of the first of its kind in California, it was painted on the churches focal interior wall. It was not merely decorative, but served a vital devotional function for worshipers. Mission San Francisco de Asís takes its “nickname” of “Dolores” from the nearby stream, Arroyo de Nuestra Señora de los Dolores. The friars honored the Blessed Virgin Mary by depicting her heart pierced by swords. For about five years before the mural was covered by the ornate wooden reredos, friars, soldiers, and native people saw the mural each day. The mural was a bridge between sacred and profane, the visible and the invisible. It was a device to allow Indians to feel the presence of the divine. The first known visual record of any decoration at Mission Dolores was an illustration in 1816 by artist Louis Choris. His watercolor painting depicting Indians dancing at Mission San Francisco shows colored geometric patterns on the lower portion of the buildings facade. The mural is part of an architectural element known in Spanish as a reredos. A reredos is often wooden with niches and holds statues or paintings. Part of the mural depicts the sacred hearts of Jesus and Mary on either side of the upper third of the mural, with a decorative recessed wall, or statuary niche, in the center, decorated at the top with a shell motif. The upper niche is richly ornamented with scroll motifs and flanked on either side with more scrolling decorative patterns. The interior of the lower niche is less decorative and painted in red. Similar ornamental motifs are found elsewhere in the old mission on the archway above the sanctuary, as well as chevron patterns on the ceiling. We know these are original native patterns as we see the same pattern in the original basketry woven by local native women over 200 years ago. In the mission church behind the huge canvas depicting the last supper are decorative patterns painted on the wall. Murals of this type often consisted of relatively simple architectural elements and were designed by a single artist. The name of the artist or artists working at Mission Dolores and their history is unknown. 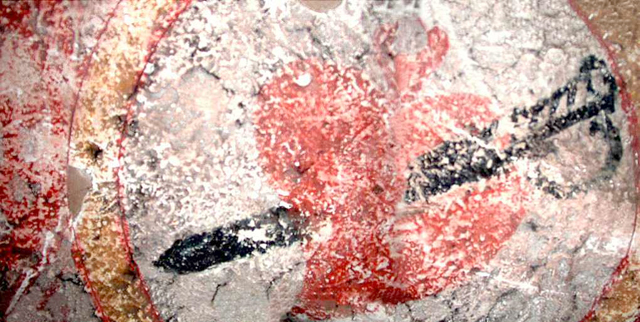 The technique used in painting the mural is termed “A Secco” or painting executed on dry plaster and adhered with a binding medium to attach the pigment to the wall. Pigments were typically made with local natural materials, such as colored earth, minerals and plant extracts. An important question that remains is the nature of collaboration between the friars and natives in the creation of the mural, whether this was a gesture of Christian piety on the part of the natives, or if the murals reflect a native aesthetic or symbolism. The mural's design and composition suggests a largely European influence. Comparing the motifs with scratched graffiti at Mission San Miguel from roughly the same period, it appears that the Mission Dolores wall decoration was executed by neophytes who had been trained to paint religious iconography, while the graffiti at Mission San Miguel was scratched by neophytes who remembered the old ways and either had not yet been taught to draw or paint in the mission style, or chose not paint in that style. Another example that reinforces this theory is a remnant of a large anthropomorphic painting on an exterior wall of an old Adobe Mill at Santa Inez. It is less European in style, while still having a quite formal placement on the exterior wall. So what really lies behind the altar in the old mission? What does it look like? As an artist, I sought to photograph this mural and to make these images publicly accessible for the first time since the reredos had covered up the mural in 1796. There was no clear understanding of the nature or condition of the mural when this project began in 2004. I worked with archeologist Eric Blind to devise a method to photograph the top section of the mural, an area covering 22 by 5 feet. These photographs were reassembled and a mosaic of digital photographs completed which has rendered the best representation of this rare artwork to date. A defining factor in the preservation of the mural over the centuries is the mural's situation in a dark, cramped space behind the historic reredos. The mural is situated on a wall about two feet behind the reredos. 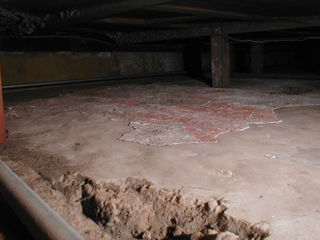 It is only partially visible from an oblique angle through a trap door that opens from the attic above. Because of its close proximity to the reredos the only way to see the mural would be by photographing it piece by piece and compositing these images together. According to the same article, ”The old sacristy walls were preserved with a sheathing of wood by Father Prendergast away back in 1862.” By 1918 the mural had already been covered for over 120 years. On April 10th 1936, a Historic American Building Survey (HABS) was undertaken by photographer Robert Kerrigan, who recorded black and white photographs of the central niche. From those photographs the central niche appears to be unchanged in condition since that time. The mission church, the mural, and the hatch opening to it are documented in architectural drawings. Detailed drawings of the sanctuary interior show painted ornament on the north and south walls, of which one design clearly resembles the images of hearts found behind the reredos. 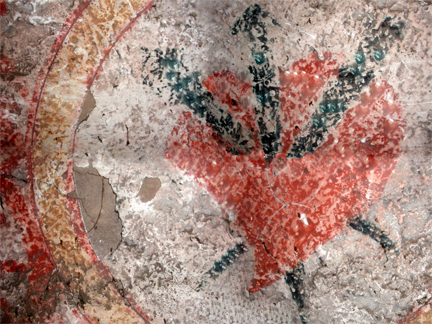 This design painted in red on natural white plaster is obviously a rooster, with intricately painted feathers and a heart in the center. The rooster is a Christian symbol of the resurrection of Jesus. During the late 1980s, Dr. Norman Neuerburg, a noted mission historian, crawled behind the altar in the cramped space to draw a sketch of the mural. Certain areas of the mural have deteriorated over time, particularly a section at the top of the mural that has been severely abraded, possibly when an electrical cable was installed in front of the mural. The mural was again brought to light while Guire Cleary was Museum Curator in 2000 when a Powder post beetle infestation endangered the historic reredos and other wooden statuary. In 2003 I approached Guire Cleary about carrying out a projection project. The project would take place at a fortuitous moment which coincided with the departure of Cleary, then a Franciscan brother, and the appointment of Andrew Galvan, an Ohlone Indian descendant, as the new curator of the Old Mission Museum. Galvan told me about the mural, and Cleary gave permission to photograph whatever might be there. I enlisted the help of Presidio archaeologist, Eric Blind, and together we went to investigate what was on the back wall. Shortly before Thanksgiving we lowered a camera behind the altar, and took a snapshot of what turned out to be the ornately decorated niche. The project had begun. In January 2004, we photographed the top 5 by 22 feet. Using Neuerburg's sketch as a guide, we devised a method using a rope and pulley system to remotely control the camera from above that would allow photography without adverse effect to the mural or building fabric. In the cramped space we worked for over two weeks photographing the mural shot by shot one foot at a time. 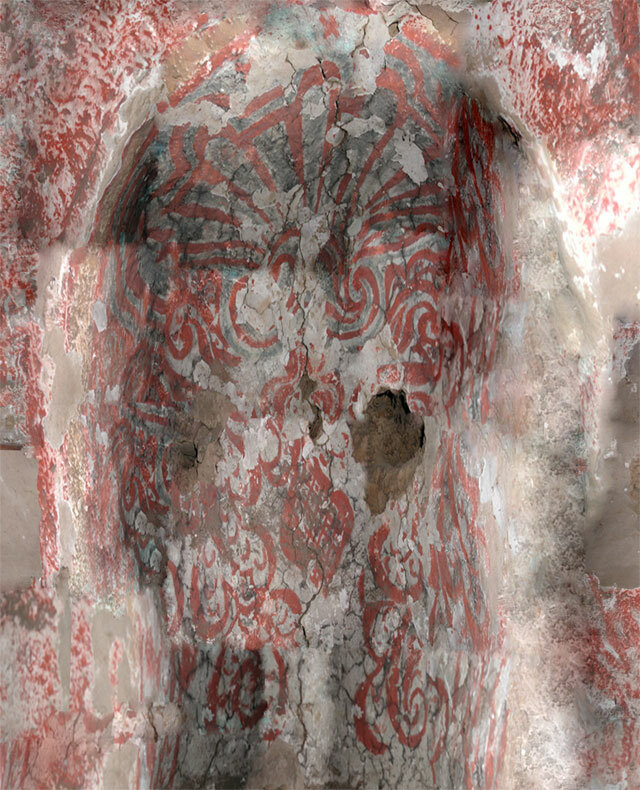 The images were computer manipulated into a single composite of the top third of the wall which reveals a central niche, abstract decoration, and religious symbols. 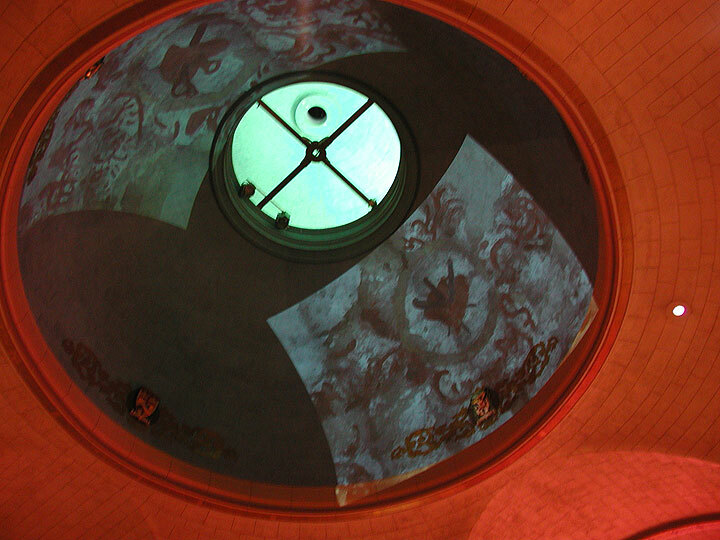 Soon after their discovery, images of a heart pierced by three daggers and a heart pierced by a sword from the mural, were projected onto the interior of the dome of the Mission Dolores Basilica for all to see. Images of the mural, forgotten for so long, were super-imposed inside the building next door after 200 of years of being hidden from view. What might the mural have looked like as it was gazed upon for the first time? Who painted it, and what was the nature of collaboration that led to its creation? These were some of the questions that arose as we sought to piece together colored digital photographs of the mural. Besides being an engaging piece of art, the mural is an intriguing artifact from a seemingly remote past. An artifact which silently stood witness for five years as a few missionaries on the frontier edge of an extended empire endeavored to convert the numerous native peoples to Catholicism and a Spanish colonial vision of civilization. So far, our photography has revealed decorative painting, perhaps not atypical of this period, but unique today, because of the mural's fortuitous position there behind the historic reredos which has preserved it for so long. There are several ways of sharing the mural that can help raise awareness about it, as well as potential funding in order to conserve both the altar and mural. Also an immediate concern is to ensure that the mural doesn't deteriorate further. A disadvantage of the murals “a Secco” process are that the pigments merely lie on the surface and do not sink into the stucco and are therefore more susceptible to flaking off over time. A priority should be to record more of the mural before it does. Further investigative photography could be carried out to see what remains of the lower 22 ft by 15 ft expanse. So far our work has been an exploratory investigation of the murals top section. Further digital photography would be an immediate and inexpensive alternative to conserving the mural, while funds are raised to carry out an expensive conservation of it. Pigment analysis would allow us to determine the original pigments hue and vibrancy, which could allow more accurate pigment selection for restoration of the painting. In the immediate present there are numerous ways to make the mural accessible in order to create awareness about it and ultimately fund the conservation of the painted reredos and the fraternal-twin reredos that covers it. Postcards could be sold in the gift shop, images could be presented as a traveling exhibit. A photographic composite of the mural could be printed and displayed at full size in the old mission as a banner. The mural could also be painted anew inside the mission museum. This could be presented both as a painting of the top section of the mural, and below as a more interpretive painting of what exists below. In the meantime Eric Blind and have I been able to create some digital examples of the mural showing the top section as it may have looked like when it was originally painted. We created a photo mosaic which was displayed inside the Mission museum from 2005 until 2008. Ever since my initial involvement with this project I have felt it my artistic responsibility to share the mural with the public. As one who has a vital role in making the mural once again accessible, I feel responsible to ensure that it remains available so that scholars and the public may learn about it. In the long term I hope to work with Mission Dolores in order to give the public a glimpse of this very important piece of San Francisco history. A public painting of the mural was unveiled at the Opening of the Mission Community Market on Bartlett Street at 22nd on April 14, 2011. Local muralists Jet Martinez, Bonnie Reiss and Ezra Eismont collaborated with Ben Wood to recreate the photographed section of the mural. The mural was a collaboration with the Mission Community Market and its organizer Jeremy Shaw. 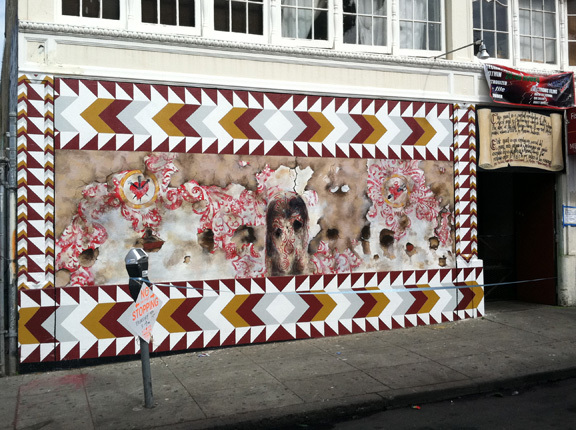 The mural was destroyed when the fire-damaged building (fronting 22nd and Mission Streets) was demolished in 2015. San Francisco Arch Diocese, Mission San Francisco de Asís, Rev. Arturo L. Albano, Curator Andrew Galvan, Guire Cleary, Eric Blind, Bay Area Rock Art Association.